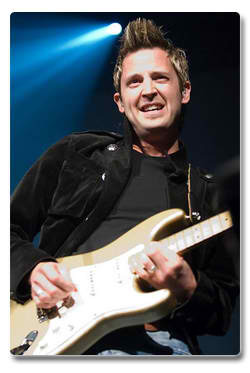 Lincoln Brewster - Are You Ready for a Change? What is “real life”? Is it the pain, struggles and moments where hope is in short supply? Is it faith in a God we can’t see and hope for a future we don’t yet know? It was an environment darkened by his stepfather’s violent behavior and alcohol addiction. An environment from which Brewster and his mother sought solace in music. As Brewster bonded with his mom through music, he began mastering a variety of instruments —including a stunning prowess on the guitar. It was this incredible talent that caught the attention of mainstream labels, landed Brewster a “gig” playing with rocker Steve Perry (formerly of the band Journey) and earned him a mainstream record contract by age 19. So after six acclaimed albums and multiple hit songs, where would Brewster’s musical journey take him next? As it would turn out, inside himself. that his songwriting was taking a decidedly inward approach. This personal approach to songwriting has yielded Real Life, a dynamic worship collection that features Brewster’s guitar expertise set against a backdrop of soaring songs of faith. Featuring co-writes with Jason Ingram, Hillsong Music’s Mia Fieldes and Dove Award winning writer Paul Baloche, it’s a project that examines and celebrates life through the perspective of someone who has truly lived. would become the catalyst for Real Life. to date. And it began with a challenge from his wife. That insight resulted in two tracks, one of which would become the title cut, a song that chronicles Brewster’s own path from childhood, to parenthood, to his future in eternity. “Real life” continued to be a theme in Brewster’s songwriting. Project opener “Best Days” offers encouragement to those who are mired in the past. Granite Bay, California. And his family—wife Laura, and sons Levi, 8, and Liam, 5—is his priority through it all. It’s a personal story that offers a universal message for every believer.